A MoU signing ceremony was held between LankaBangla Finance Limited and Rancon Motors Limited. Under this agreement the customer will be facilitated with special rate of interest & maximum loan facility for both Individual (upto 90%) and Corporate (upto 100%) for the purchasing of Mercedes Benz with LankaBangla Auto Loan. It will also cover special services such as Premium loan approval procedure, minimum processing fees, dedicated customer service team etc. 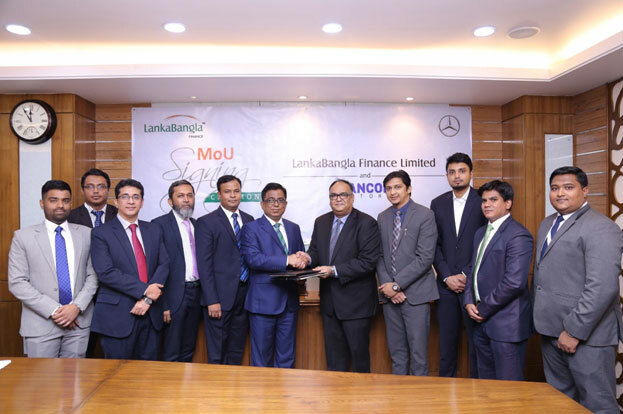 In this ceremony, Mr. Khurshed Alam, Head of Retail Financial Services; Mr. Kazi Masum Rashed, Head of Credit Risk Management; Mr. Khandakar Zakaria, Head of Auto Loan from LankaBangla Finance Limited and Mr. Samiul Alam, Senior GM Operations; Mr. Safayet Chowdhury Jason, Head of Sales; Mr. Rubaiyat Saad Majid, Deputy Manager Marketing from Rancon Motors Limited were present.